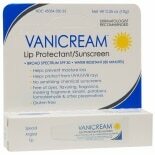 Shop Vanicream Lip Protectant/ Sunscreen SPF 30 (.35 oz. ).35 oz. $520$5 and 20 cents$14.86 / oz.